This project compiled the amount of damage done to the player’s active Pokemon over a span of one month’s time, encompassing over seven hundred attacks. It calculated many high level statistics and provided a detailed breakdown as well, including damage done by individual attacking Pokemon. The research identified the occurrence of each amount of damage and an analysis of the frequency of amounts of damage. Finally, this study also recorded the frequency of attacks that included an effect upon the active Pokemon. This study tracked the amount of damage an opponent’s attacking Pokemon did to the player’s active Pokemon. It also recorded whether or not the attack included an effect upon the player’s active Pokemon. This analysis identified many high level statistics and provided a detailed analysis at the individual Pokemon level as well. This study also only included attacks from opponents’ Pokemon. All data was recorded from games taking place on the Pokemon Trading Card Game Online website in matches either on the versus ladder or in tournament events. A few of the major tenets guiding the study need to be clarified before presenting the details of this research. Identifying the amount of damage an active Pokemon does to the opponent’s active Pokemon sometimes varies depending upon cards played by the attacking player. For example, Professor Kukui (Sun & Moon, 148/149) adds an additional twenty damage to the amount of damage done to the opponent’s active Pokemon. Fighting Fury Belt (Breakpoint, 99/122) adds an additional ten damage to the attack. This study included all increases from damage augmenting cards. For example, if Tauros GX (Sun & Moon, 144/149) had a Fighting Fury Belt attached to it, seventy damage was recorded for this study. However, if a Pokemon had the advantage of weakness – meaning that the opposing active Pokemon was weak to the attacker – then that damage to the defending Pokemon was reduced by half. Although this study included all damage augmenting cards, it did not include the full amount of damage if the defending Pokemon was weak to the attacker. In this case, the weakness was ignored (reduced by half) and recorded in the study as if the defender was not weak to the attacking Pokemon. For example, if Volcanion EX (Steam Siege, 107/114) attacked Decidueye GX (Sun & Moon, 12/149), 130 damage was recorded and not 260. Only attacks with effects that directly impacted the active Pokemon were included for purposes of this study. For example, if Jolteon EX (Generations, 28/83) attacked with Flash Ray, this would not have counted as an attack with an effect. Espeon GX’s (Sun & Moon, 61/149) Psybeam attack, however, would be recorded as an attack with an effect. The only effects covered by this study include paralysis, sleep, poison, burn, confusion, and discards of energy. Damage done to benched Pokemon was also excluded from the compilation. This means that half of attacks on an active Pokemon were for 80 damage or less and that 75% of attacks did 120 damage or less to the active Pokemon. Below is a list of the frequency that amounts of damage occurred. The results of this analysis show that if a Pokemon has even only 90 HP, it will be knocked out by a single attack less than half of the time. If a Pokemon has an HP of 160 or more, then 90% of the time, it will not be knocked out by a single attack. Finally, for some of the new GX Pokemon with 240 or 250 HP, only about one percent of the time would they be knocked out by a single attack. Here you can see that the vast majority of attacks do less than 150 damage. Please keep in mind that weakness or resistance were not factored into the damage amounts for these calculations. The highest amount of damage done during this collection was 420. The amounts of damage that occurred most often are detailed below. 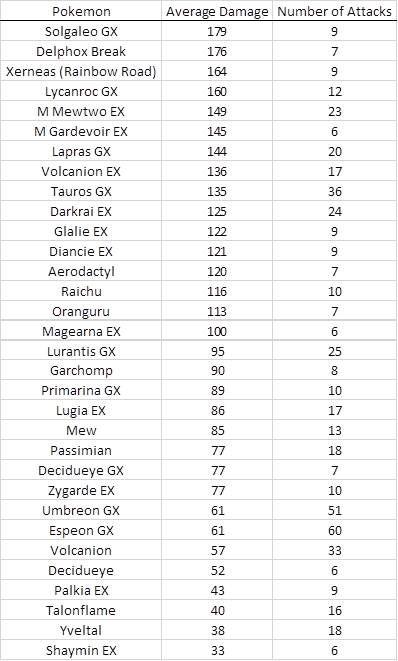 Below is a list of the average amount of damage done per attack by an individual Pokemon. Please note that there is a six attack minimum for inclusion in this chart. Pokemon that attacked five times or less were excluded from this chart. A full list of every Pokemon and every attack can be found in the Appendix at the end of this report. This study also looked at how often attacks on an active Pokemon included an effect that directly impacted the active Pokemon. The effects included in this analysis include: paralysis, poison, sleep, burn, confusion, and the discarding of energy from the active Pokemon. This study found that, on average, only 13% of all attacks included an effect that directly impacted the active Pokemon. This number includes coin flip related effects that failed. A detailed list of all Pokemon and their attacks can be found in the Appendix at the end of this paper. This study found that the average amount of damage done to the active Pokemon was about 88 points. The median damage amount was 80 points. The vast majority of attacks did less than 150 damage to the active Pokemon. 13% of all of the attacks collected in this analysis included effects that could directly impact the active Pokemon.